Not an art update. Oops. One song that seemed perfect was the track Petite Chou-Fleur from Team Fortress 2’s Meet the Spy video. Unfortunately, I couldn’t find the sheet music easily! So I ended up transcribing (what I’ve dubbed the unscientific process of, “earballing”) the song myself. The results are here. 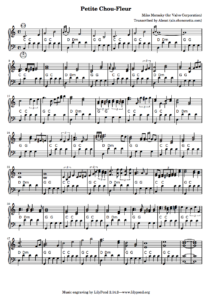 One of the fun things about using Lilypond to do the transcription is that I get a MIDI file to play with too! Here it is, though I’ve found the grace notes don’t sound correctly. Yay MIDI. If you play piano you might want to grab this version of the sheet music instead, though you might want to revise the chords. I haven’t put a lot of effort into ensuring they make sense – they’re mostly compromise between getting the chord notation to come up properly for my simplified accordion score and getting some bass notes to sound in the MIDI. I’ve done my best to transcribe the piece accurately, but there will inevitably be errors. Let me know if you think anything’s wrong. I hope to have a proper accordion recording of this up soon, too!